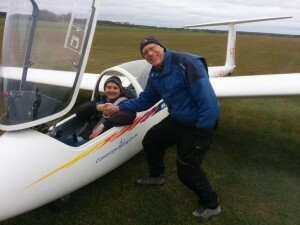 You do not need any prior experience to start gliding, most people are able to learn the basics and have their first solo flight in under a year. It is about as easy a learning to drive. However unlike learning to drive there is no pass/fail moment instead there is a continuous progression of learning and unlocking more privileges. Members can use our online booking system to book a half day training session at a time and date that suits them. Sessions are on a 2:1 student to instructor basis with each student getting 3-4 flights each during a half-day slot. Instructors will also provide briefings and de-briefings during your slot. There are usually two instructors on-duty at any one time. If you are unable to book a slot on your chosen day you may still turn up as there is sometimes some unused instructor capacity. We have discount rates for children and spouses of members. Most people need 50 – 100 flights to complete their pre-solo training. For a full cost explanation click here. Once you have completed all the pre-solo exercises to a suitable standard you will be ready for your first flight on your own. Your first solo is an unforgettable experience and something you will be really proud of achieving. After going solo you will mix flights on your own with additional training to refine your skills and check your progress. You will also convert to flying single seat aircraft which typically have higher performance. A solo pilot must stay close the airfield. If you wish to go further you need additional training and must pass written and practical exams. 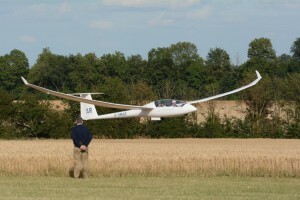 On completion, you can apply for a Light Aircraft Pilots Licence (Sailplanes).